What does 2015 hold in store for the people, business owners and traders of Morpeth and the surrounding communities? It’s a fair question to ask at the start of a year that promises to be one of significant change for the whole country. There are less than 80 days to go before what looks like being the most unpredictable of Parliamentary elections in a generation. For the past five years Britain has been ruled by a coalition government of Conservatives and Liberal Democrats and, if the pundits are to be believed, another coalition looks on the cards. However, which parties would make up the constituent sums of any new government, they are equally agreed is less certain. Whoever governs after May 7 will have to deal with repercussions in the aftermath of last year’s Scottish independence referendum. In the run-up to voting day the three main political parties pledged greater powers for the Scottish Parliament, which, in turn, could see more responsibilities, decision-making and funding devolved to English regions such as the North East. There will, of course, be a settling-in period for any new government, which local politicians will need to be conscious of so that no delays are allowed to drift in regarding decision-making and investment opportunities. So plenty of changes afoot nationally. Closer to home the forthcoming year is also likely to be one of great significance for Morpeth and the people who live and work in the town. The Morpeth Neighbourhood Plan (MNP), which will be the blueprint for the way the town and its surrounding communities develop over the next decade and a half, is edging nearer its final publication date. 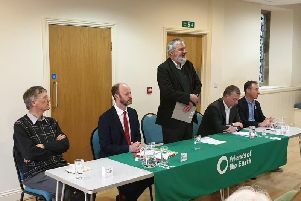 Volunteers and local residents, not planners, who have been working on the Plan for nearly three years, have just undergone a consultation exercise on the draft proposals, which, if approved, would be put to a public vote later this year to seek its endorsement by a majority of local people. The draft Plan sets out to manage and direct the growth of Morpeth from now until 2031, at the same time as retaining its distinctive character, heritage, history and charm, all allied to its continued development as a thriving, vibrant modern market town. It also identifies some key opportunities for Morpeth going forward. The Morpeth Town Team has been a key driver in the formation of the MNP, recognising its importance in sustaining a cohesive approach to the development of Morpeth. For example, there has been much talk and speculation over how many new houses could be built in and around the town during the Plan’s lifetime. The Plan is working on a figure of some 1,700 new homes, more than 1,100 of which already have planning approval. It also identifies a need for land where new jobs could be provided; the designation of a primary shopping zone; the desirability for one or more new hotels; and a replacement for the Riverside Leisure Centre, as well as recognising the aspirations for an arts and heritage hub to be created centrally in the town. Councillor Ken Brown is one of two Morpeth Town Council representatives on the Town Team, along with Councillor Stuart Lishman, and has been actively involved in the preparation of the Neighbourhood Plan so is acutely aware of the vision it sets out for Morpeth and its surrounding parishes. At the same time he has also been closely involved in developing a five-year strategic plan just agreed by other partners of the Town Team, including Morpeth and District Chamber of Trade, the Greater Morpeth Development Trust, Sanderson Arcade and Inside Morpeth magazine. “Both plans focus on the direction we would like Morpeth to travel in over the next few years and demonstrate how we need to all work together in partnership to achieve those ambitions,” he said. “As a Town Team our focus has to be on maintaining the vibrancy of the town centre as a key economic driver for Morpeth. “The team has also tried to bring a cohesive approach to partners focusing on the bigger picture and what is in the best interests of the town. “Morpeth has felt the impact of the recent downturn in the economy, but appears to have survived better than others to maintain its place as a premier, modern market town that continues to draw in visitors because of its heritage and history, its parks and riverside walks just a stone’s throw from the centre of town, and its well-developed retail offer that has been buoyed over the last five years by the emergence of Sanderson Arcade as an attractive magnet for shoppers from across Northumberland, Durham and Tyneside. We also are blessed with an abundance of excellent coffee shops, cafes and restaurants offering a wide choice for anyone looking for refreshments, and of course, a mix of ‘big name’ stores and smaller, independent traders that is not replicated anywhere else in the region and gives Morpeth its unique character and flavour. “What is noticeable is that business people seem to have confidence in the future of Morpeth and that is something we need to welcome and encourage. They include the Pudding Parlour in Sanderson Arcade, a Turkish restaurant at the end of Bridge Street and the Swedish Handelsbanken, which is extending its operation in Morpeth. Kitchen company Pol Kefton, which already operates from a studio in Coopies Lane, has also announced that it is opening its first retail outlet in the arcade to showcase its new range of kitchen, home and giftware. “One of the most pleasing aspects of working on the Neighbourhood Plan over the past three years has been the number of local people who have voluntarily stepped forward to become involved in its preparation,” said Coun Brown. “They have willingly given up considerable amounts of their own time to research and inform the Plan’s content so that it is very much a ‘Plan of the People’ and not one drawn up by the professional town planners. “What we need now is the same public-spirited approach to the ongoing work of the Town Team. All the partners are signed up to funding the team over the next few years, but we do need the support and involvement of local business owners and shopkeepers if we are truly to represent the views of the retail and business sector as to what more needs to be done to promote and market Morpeth not just as a great place to live and work, but to visit and shop. “Next week the Town Team is holding an open event so that we can explain in person what we are trying to achieve on behalf of Morpeth, and to invite more people to join us in doing that. l The Morpeth Town Team meeting is being held on Tuesday February 24, at 6pm, at Morpeth Town Hall. It is open to anyone to attend.